Curogan is a copper-tin-alloy with a high copper portion and some additives which make the material strong - but without any nickel. 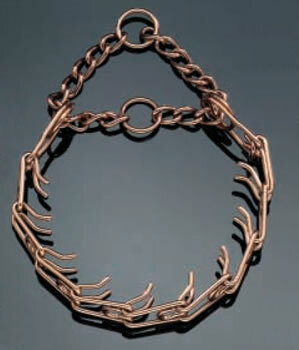 Therefore these chains avoid a discolouration of fair haired dogs. After selling these articles for ten years, the experiences of our customers show that still some dogs (less than 10%) do react on Curogan with a discolouration. - A further advantage of CUROGAN is the fact that it is absolutely free of nickel. More often nickel is also responsible for allergic reactions of sensible dogs and causes for example skin rashes.